Some people prefer hard candy Christmas treats instead of chocolate candy. Hard to believe, I know, but it's true! If you're one of 'those' people, there's a great selection of hard Christmas candy at the bottom of this page. I've scouted around for the best deals for you. Want to make your own? Great! Here are some adorable and simple recipes that you can use to make beautiful hard Christmas candies in just a matter of minutes. For this first recipe, you can really use almost any type of hard candy that you can buy at the store. Jolly Ranchers are an excellent choice. They have vivid colors and really strong flavors, so they work great. I like to call this "Stained Glass Candy" because that's exactly what it looks like to me when it's all finished. Your kids would probably really enjoy making this. Wrap the bottom and sides of your chosen cookie cutters with aluminum foil and place them on a baking sheet. Spray the insides of the "molds" with cooking spray. Place one layer of hard candy in the bottom of the cookie cutters. Use any combination of colors you like. Place tray in the oven and bake at 350° for 10 minutes, or until the candy is completely melted. Allow the candy to cool for 2 minutes and then use a skewer or chopstick to poke a hole through the top part of the candy so you can put a ribbon through and hang it. 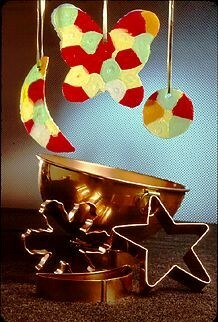 When candy is completely cool, remove from cookie cutter mold and add your ribbon! Isn't that lovely? The simplicity and fun of this recipe makes it one of my favorite hard candy Christmas making activities. Cut the licorice in long pieces - about 12-15 inches. You'll need one for each wreath you're making. String the licorice through about 15 Life Savors. You can use multi colored ones, all the same color, or create a repeating pattern. Tie the ends of the licorice into a bow and hang the hard candy wreath on your choice of mini door, or just hang it directly on your tree as an ornament. I know these hard candy Christmas recipes aren't truly homemade, but they are perfect to make with the kids. I'll bet they'll always remember having a part in making Christmas special. If you really do want to 'do it yourself,' here are some more Christmas hard candy recipes that will let you cook to your hearts content. Have fun! I want to see what you've made, so come back and add your photos and recipes.